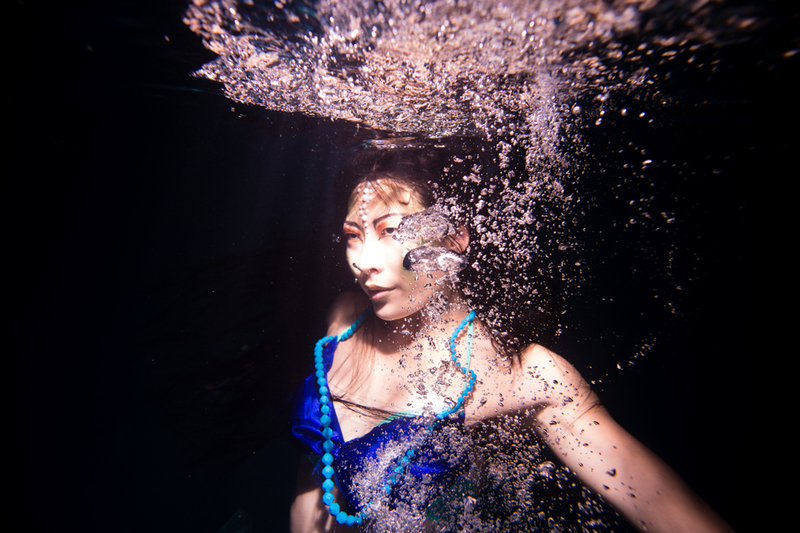 Underwater photography is one of my favourite things to do, frustrating at times, but definitely worth it. 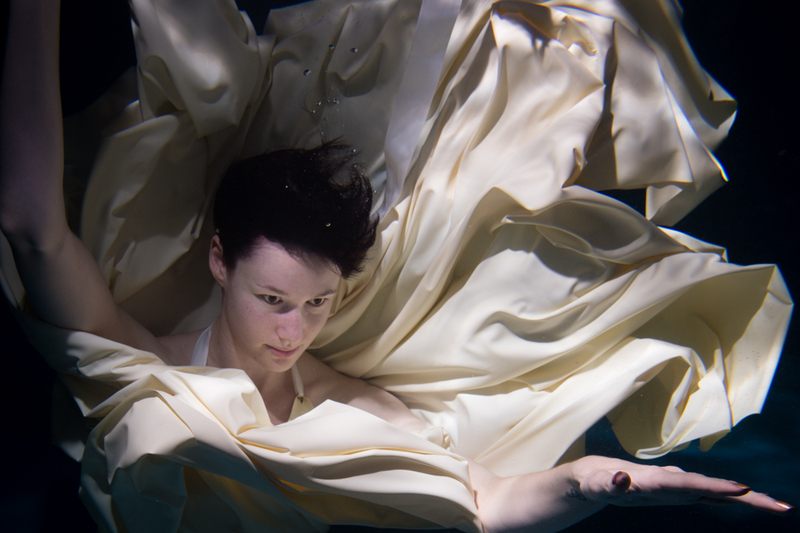 Most people I photograph have never modelled underwater before and can be somewhat nervous about it. Really there isn't much to be nervous about. It can be a little uncomfortable, and can be very tiring, which is why I usually keep underwater photo sessions to an hour and a half or so. 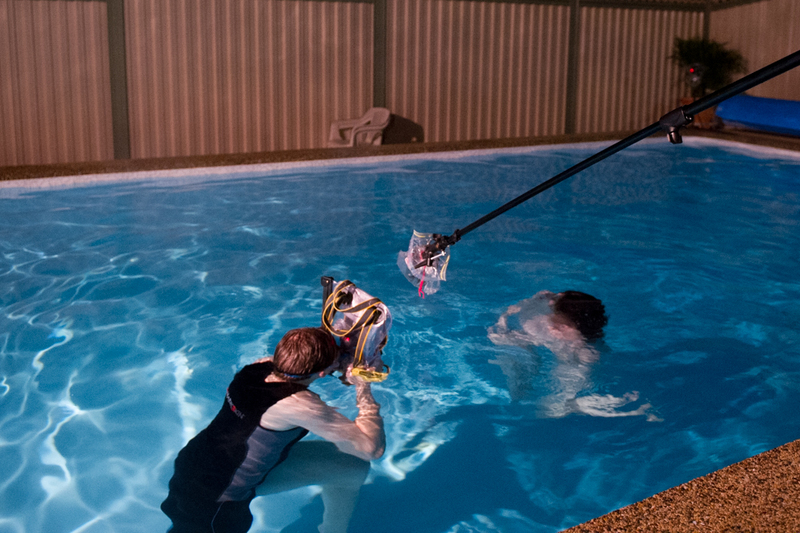 Preferably I also use a pool that is heated, as over the length of the shoot it is more comfortable. The basic setup for the shoot is as shown in the photo above. I have a single flash out over the pool on a boom, which is triggered from the camera in the underwater housing. Typically the process is that I'll duck under the water, trigger the flash once to make sure everything is working, the person being photographed then ducks under and poses while I take photos until the model surfaces. 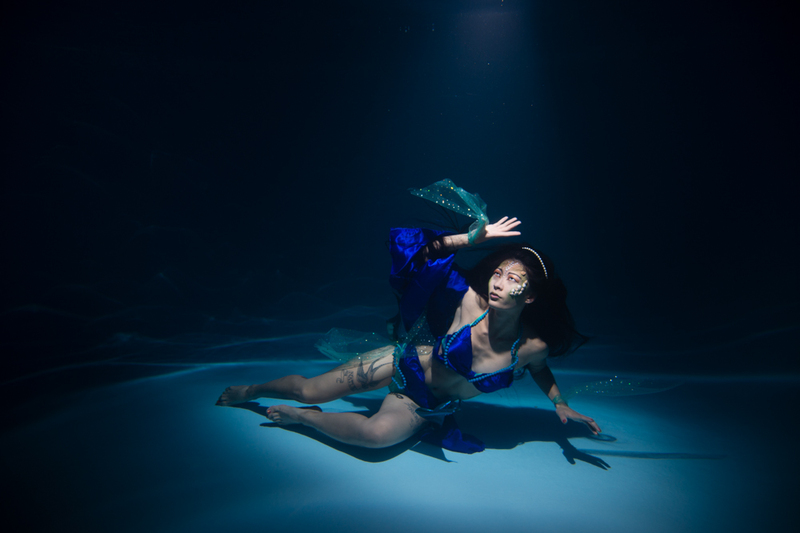 Posing depends a lot on the person being photographed, and how comfortable they are in moving underwater. 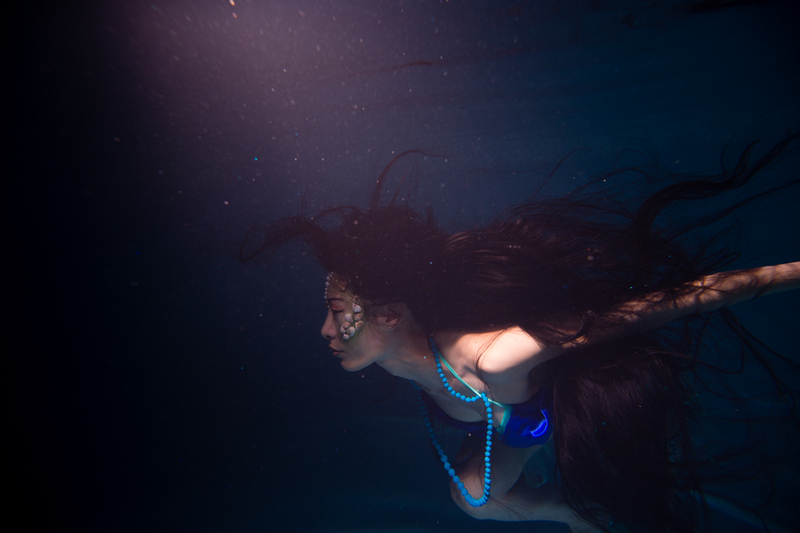 For those not completely comfortable with being underwater, the shoot can take place in water that is shallow enough for the model to stand up in and have their head above the water. If they are comfortable being underwater it can take place in water that is deeper than they can stand in, generally I try and carry out the shoot where the water is around head height. Poses can be standing with your feet on the ground, or floating. 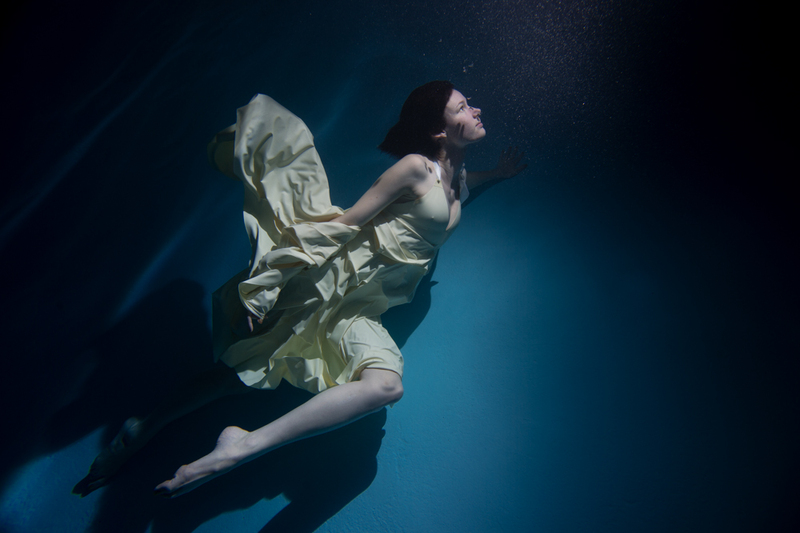 If floating, it is usually better to breathe out before submerging as it's easier to control your position underwater. If you breath in, it's harder to control your position as you are trying to overcome the air in your lungs making you float up. You'll notice that I am not far away from the model. When underwater the further away you are, the harder it is to focus, and the less contrast there is in the photo. There is also a magnifying effect on the lens, so a wide angle lens is usually used. As the photographer, the most difficult part is framing and focusing to take the photo. Although I'm wearing goggles, and there is a viewport on the back of the camera to see through, there is generally water between the two and all I can see is a very vague outline of the person I'm photographing. 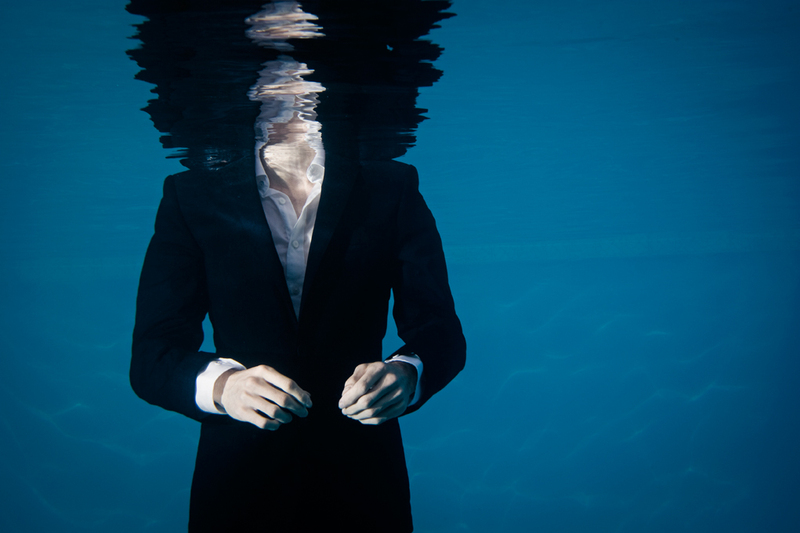 Underwater sessions can take place in private pools, or in public pools that have been hired. If you have access to a private pool, I need enough space to set up the light stand in a suitable place. The water also needs to be as clear as possible. Public pools have the downside that they usually have lane markings on the bottom of the pool, and you often can't hire the whole pool, so there are people in other lanes. One upside to public pools is that they are often indoors which means photo sessions can take place at any time of day. 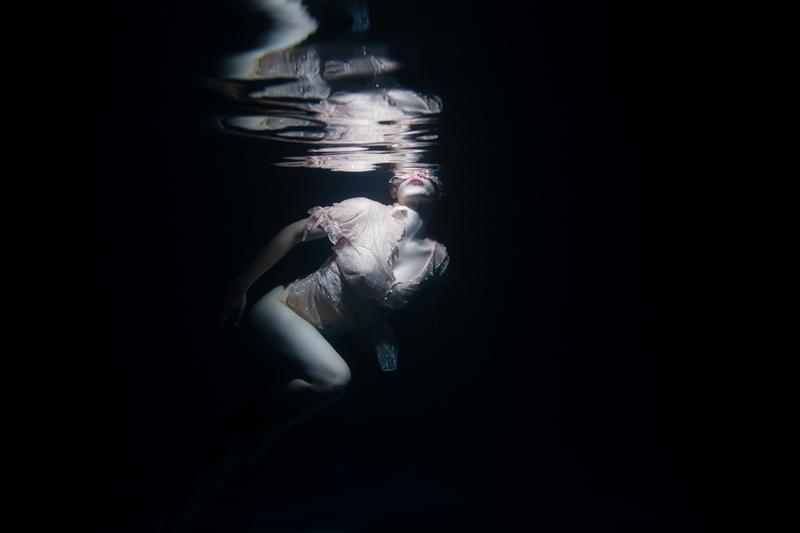 Private pools tend to be outdoors, so for my style of underwater photography the best time to carry out the session is after sunset as I have better control of the light. The most difficult thing from the model's perspective is getting a decent facial expression, this is another way in which breathing out helps, as your cheeks puff up less. Additionally a salt water pool will help as they are easier on the eyes, chlorine pools can be very uncomfortable to open your eyes in for any length of time.